For most of HD camcorder enthusiastic fans, they must know about MTS files, or called AVCHD or AVCHD Lite files, abiding by the difference on configurations of the MTS files. It is a format used on most of HD camcorders. But you will find that MTS format is not very easy to be compatible in many editing programs, such as Final Cut Pro X, iMovie or iDVD; and it can not be used on many mobile devices directly, such as iPad 2, iPhone 4S, and Motorola XOOM, etc. 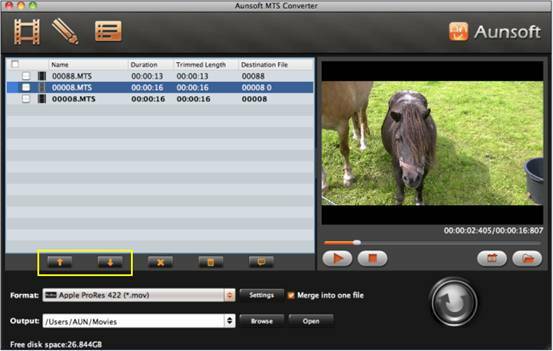 So you will need a MTS Converter after shooting from HD Camcorder, which will help you convert MTS to Mac compatible format, and ProRes 422 for FCP X. Or an AVCHD conversion tool, which will help you convert MTS to MP4 for iPhone 4S, iPad and Motorola XOOM, etc. Besides MTS conversion, MTS editing is also necessary. For example, you will need merge, split, cut or trim the MTS file. But you will notice that those editing jobs can not be done by a common MTS Converter in a very easy way. For example, you can load your MTS files into Aunsoft MTS Converter for Mac, select the output profiles and then Convert them all. But you will not be in such a fantastic way to edit the MTS files. If you want to Merge the MTS files, you can use the "Merge into one file" option offered in the MTS Converter. But can you arrange the order of MTS files easily? You can only use "Move up" and "Move down" buttons to adjust them in the list. In this way, you have to highlight the file first, and then click "up" or "down" button. By clicking the button one time, the file will only move up or down just one line. It means you will click the button 4 times if you have 8 files in the program list and you want to move the originally 3rd file to the last line in the list. It would make you frustrate if you have several hundred files. But if you took another specific camcorder tool that Aunsoft offers a look, you will find it will do a much better job to merge the MTS files. It is called Aunsoft Final Mate for Mac. Aunsoft Final Mate for Mac is not only a professional MTS Converter which can complete all the MTS conversion jobs like any other MTS Converter programs, but also an easy to use MTS Editor. If you want to Merge your MTS file, you can finish the editing jobs on the Time Line it offers. After you drag all the AVCHD MTS file into the Time Line of the program, you will be able to arrange the final output orders just by dragging the file to the target place directly on the Time Line of the program. And also, on the Time Line of the program, you can easily split or cut the MTS clips to create a new clip or a new movie easily. Of course you can drag new clip to a new position on the Time Line, too. 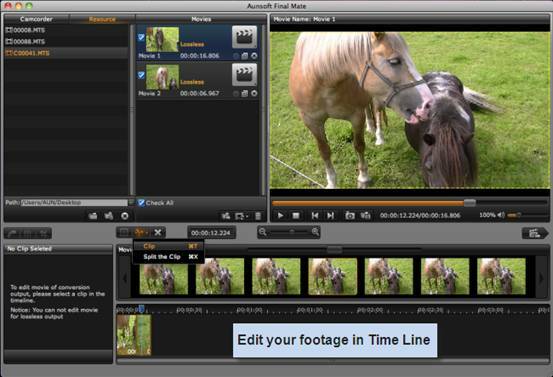 For the whole process, the MTS files you loaded into the Time Line will be edited like a whole movie project. Yes, you will not find such a Time Line component in the so-called MTS Converter program and it marks that Aunsoft Final Mate is also a MTS Editor program. Besides the Time Line component, Aunsoft Final Mate also provides a Frame by Frame editing component, which will help you a frame accuracy editing, such as Cut and Split in an accurate frame instead a GOP. It is an important feature for Aunsoft Final Mate to work as a MTS Editor. In the next article, we will talk about the frame by frame feature of the program. And also, you will know what Frame accuracy means.